Hepatocellular carcinoma (HCC) is the most frequently detected primary malignant liver tumor, representing a worldwide public health problem due to its high morbidity and mortality rates. The HCC is commonly detected in advanced stage, precluding the use of treatments with curative intent. For this reason, it is crucial to find effective therapies for HCC. 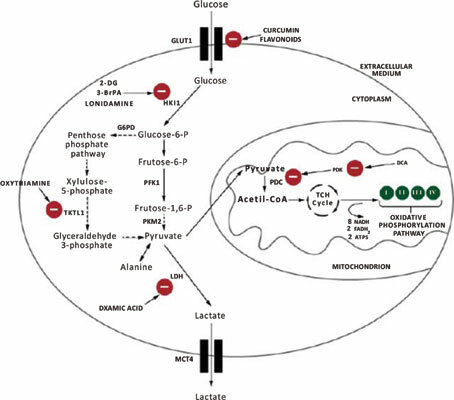 Cancer cells have a high dependence of glycolysis for ATP production, especially under hypoxic environment. Such dependence provides a reliable possible strategy to specifically target cancer cells based on the inhibition of glycolysis. HCC, such as other cancer types, presents a clinically well-known upregulation of several glycolytic key enzymes and proteins, including glucose transporters particularly glucose transporter 1 (GLUT1). Such enzymes and proteins constitute potential targets for therapy. Indeed, for some of these targets, several inhibitors were already reported, such as 2-Deoxyglucose, Imatinib or Flavonoids. Although the inhibition of glycolysis presents a great potential for an anticancer therapy, the development of glycolytic inhibitors as a new class of anticancer agents needs to be more explored. Herein, we propose to summarize, discuss and present an overview on the different approaches to inhibit the glycolytic metabolism in cancer cells, which may be very effective in the treatment of HCC. Glycolysis, hepatocellular carcinoma, cancer, GLOBOCAN, EGFR, GLUT.